Those lucky enough to attend CinemaCon earlier this year got to see the first teaser trailer for M. Night Shymalan’s next, highly anticipated film, Glass. 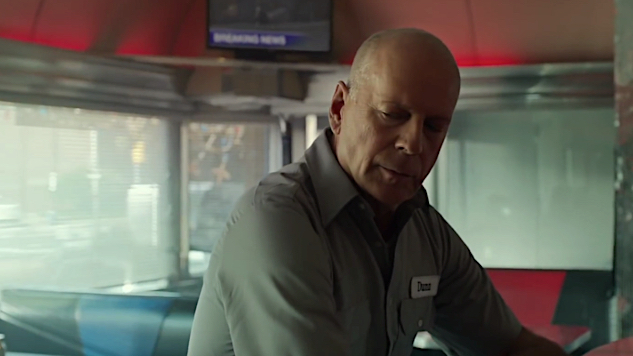 It is a surprise sequel to both Unbreakable and Split, with the post-credits stinger for the latter tying the two films together, to the surprise of many. Ever since its announcement, fans have been eager to learn more about the forthcoming quasi-superhero sequel. Shyamalan has been tweeting about Glass for a while now, with the first of three recent tweets confirming that progress on the film’s edit is going well and the second teasing fans about the film’s Comic-Con 2018 presence. Finally, he shared the first look for Glass via a brand-new poster. The poster showcases James McAvoy’s The Beast from Split alongside Bruce Willis’s David Dunn and Samuel L. Jackson’s Elijah Price from Unbreakable in a psych ward or prison of sorts. Their normal selves remain upright, each colored differently as to represent their powers and morality, and their super-powered alter egos are shown as reflections on the spotless tile floor. Based on news from CinemaCon, Sarah Paulson (American Horror Story) plays a psychiatrist who specializes in treating patients who believe themselves to be superpowered beings. David, The Beast and Elijah are her patients, and they are all locked up together. The film is set in a grounded universe where the lines between superhero and supervillain are blurred in a hue of obfuscating grey. Now, with a premise like that, what could go wrong in Glass? The other standout character in Split, Anya Taylor-Joy’s final girl Casey Cooke, will be returning for the sequel. Glass is set to shatter its way into theaters on Jan. 18, 2019.